Best way to import analog video tape to Mac? I want to transfer my family's analog video tape collection to digital form on my Mac (mid-2014 MacBook Pro). Unlike the asker in Best way to import analog video (VHS) to Mac, my goal is not to identify an inexpensive solution but rather to preserve video and audio quality. I would prefer to do it myself because besides being naturally hands-on I can't risk these being lost/damaged/not-returned if sent out. Details of my particular situation follow, but please feel free to provide answers, background, and further considerations useful to future readers with similar but possibly varying needs. which are 10 to 15 years old. How can I best preserve the content of these tapes? What device and/or software should I use to transfer and convert the videos into digital format? What target video file format should I choose to preserve quality and maximize flexibility? Electronic-only files are fine with me -- I don't particularly need or want to burn to DVD or Blu-ray. I recently did this type of project with a similar Sony Camcorder that didn't have a USB interface. Video output (as stated) is either S-Video or component - both of which can handle up to 480i (in the US). IMO, color was better on the component, but YMMV. What's important to note here is this is the highest quality that will be achievable. You won't be able to convert this to HD quality simply because the source isn't HD quality. 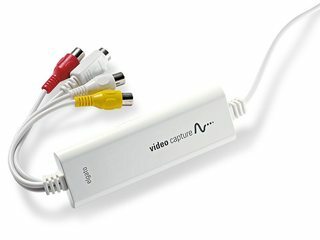 I used (and highly recommend) the Elgato Video USB Capture. This was a plug-and-play device. The included software was extremely easy to use. When I used it, I was on Yosemite (10.10), however, I don't see any reason it wouldn't work with El Capitan or Sierra. What target video file format should I choose to preserve quality and maximize flexibility? H.264 MPEG-4 is a format that's commonly used for Blu-Ray (DVDs) and for Internet services such as YouTube. This will give you the highest amount of flexibility at the best resolution possible. As far as audio, the Elgato Video Capture samples at 48 kHZ at 128bits which is considered "professional grade"
The standard audio sampling rate used by professional digital video equipment such as tape recorders, video servers, vision mixers and so on. This is a rather inexpensive setup that worked extremely well (from personal experience). It took me just over a week (about 100 tapes, not all were "full") to digitize everything. But once that was done I was able to make backups to both HDDs and DVDs. Not the answer you're looking for? Browse other questions tagged software-recommendation video hardware-recommendation encoding . Best video encoding to preserve Macbook Air battery life? How do I simply import mini-DV content onto a Mac? Multithreaded Video Converter on Mac? How can I import GoPro mp4 video to iMovie 11? How do I import from a mini DV camera without using the tape? Direct Analog Video conversion for iPad?